Normandale Lutheran Church « Loving. Learning. Worshiping. Serving. ATOP Phase 2: You have MADE, and continue to MAKE the difference! Thank you for your generosity. Thank you for your faithfulness.Thank you for serving the future congregation of NLC. We have surpassed our goal of $4.8 million dollars, and as of today, we have received more than $4.825 million dollars in gifts and pledges. In 23 months of the 5-year campaign, we have already received nearly $3 million dollars in gifts. God gave us the vision, the strength to meet it, and the faith and courage to step forward. Our brothers and sisters in Ranchi, India thank you. Our partners in housing ministry thank you. The elders served through Healing and Wholeness thank you. The Vision for Healthy Living thanks you. The Center for Arts and Spirituality, the surrounding community of artists thank you. The people for generations who will have a contemplative, intimate, sacred place to worship and pray, thank you. We are dancing in the glory of the Lord. We are celebrating your generosity. We are tapping our toes, whistling a tune, and walking with a bounce in our step! For all that is behind us, thanks be to God. For all that is still to come, YES! Exciting news! We are ever closer to our goal of $450,000 in remaining pledges to move forward with the construction of the multi-purpose chapel! This has been an incredibly generous response from our congregation, and we are now $219,000 away from reaching our goal! 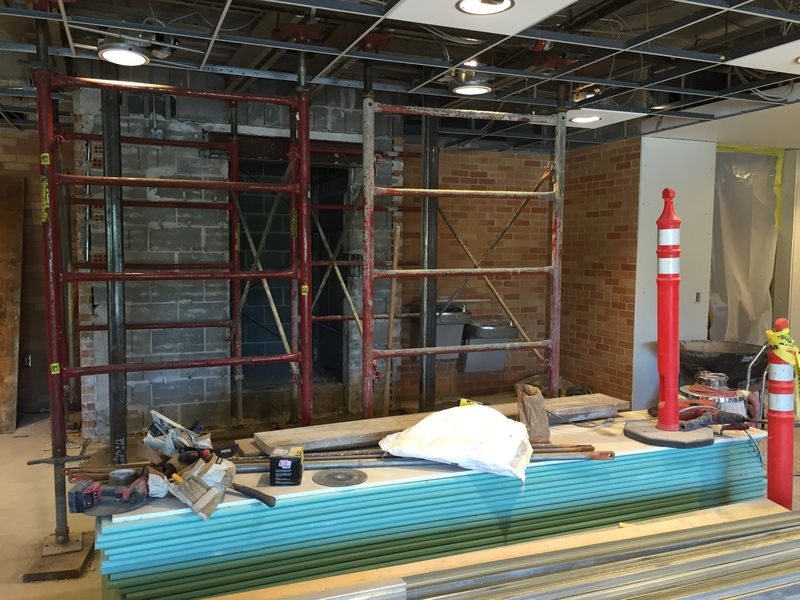 You can continue to keep track of ongoing progress on the visual display in the Fireside Room. Thank you for your gifts and commitments that have brought us to where we are today! It’s hard to believe that just 18 months ago, we voted to move forward on this venture. And, since that time, gifts and pledges have exceeded $4.5 million. Thank you for all you have accomplished through these gifts for outreach and for improving our facilities, for today, and for generations to come. Thank you for your gifts and commitments that have brought us to where we are today! It’s hard to believe that just last year, we voted to move forward on this venture. And, since that time, gifts and pledges have exceeded $4.4 million. Your gifts are already being put to use! Phase One of construction is complete and came in under budget. We have beautifully enhanced facilities for hospitality, accessibility, connections, and service. Due to generous contributions to ATOP and to our shared Operating Fund in 2016, 19.9% of gifts will be given away for those in need both in our midst and around the world. How can we fully realize our goals and dreams at NLC through ATOP? Through your gifts and pledges, we have surpassed 91% of our $4.8 million campaign goal. 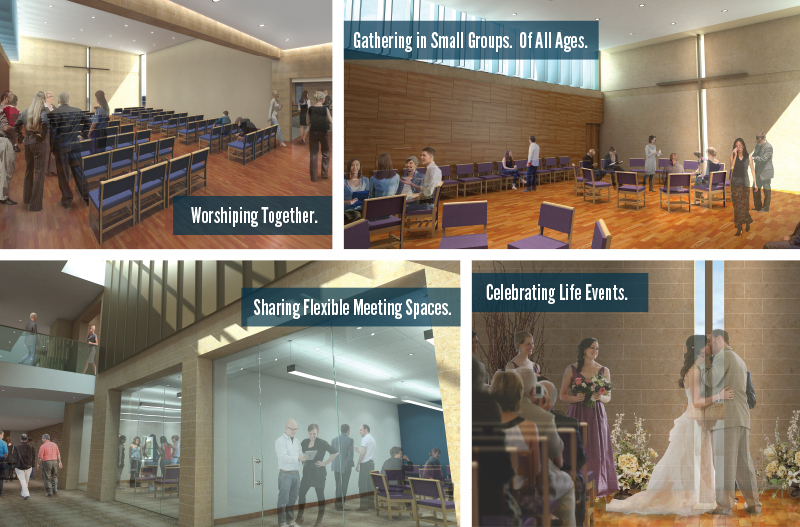 Additional pledges of $400,000 (over 4 years) will fully fund our outreach ministries and signal that the construction of the multi-purpose chapel (see below for more information) can begin. THANK YOU for your generous response! People have gathered in sacred spaces, both large and small, throughout human history. From ancient burial grounds to majestic cathedrals, human beings mark spaces for the purpose of giving some material definition to the presence of God. Though we know God exists everywhere, we set aside spaces as reminders of that truth. What will be the look and feel? Imagine even more light streaming into our beautifully transformed Fireside Room! New skylight, glass wall infill near the coffee bar, and the existing closets are removed, allowing light to stream through. A glass railing with a thin wood cap will create a new bridge walkway into the chapel. Inside the chapel, find beautiful walnut wood veneer, with limestone glacier buff-colored honed and rock face stone. Art glass allows light to stream in… and out. 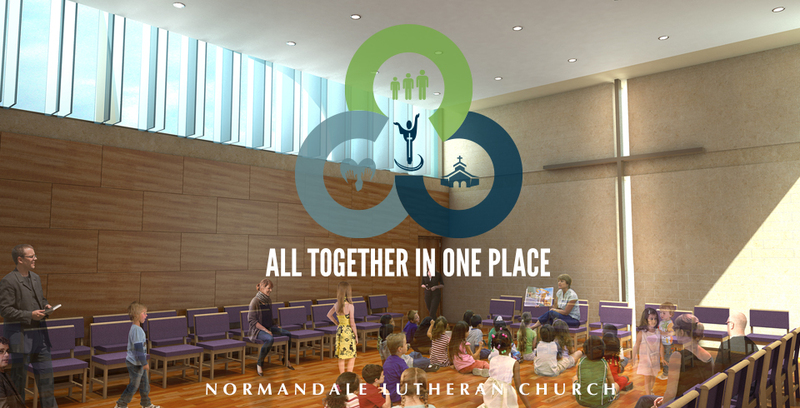 This multi-purpose chapel will provide a space for reflection and prayer, a small support group gathered in a circle, joyous music, small worship services including funerals and weddings, and 100+ energetic children sitting on the floor. Below the chapel, meeting and studio rooms will provide welcoming spaces for conversation or movement. The renovated half-gym will be used for large motor activities. On Sunday, December 13, we gathered in the Fireside Room and then traveled together through the building to our newly refurbished spaces, dedicating each place as we went to the glory of God for our current and future mission and ministry. Click above to see the short video produced for the dedication, highlighting the progress made so far and looking forward at what is to come! We will begin by gathering in the Fireside Room and then move around to our newly refurbished spaces. Let us gather All Together in One Place, as we dedicate this project to the glory of God for our current and future mission and ministry. This week, work continues on the AV room and sound systems in the sanctuary. A brick valance for a retractable screen is being installed that will greatly enhance our visual experiential and communication abilities. You can see a rendering of this on display in the narthex. We anticipate that the screen, along with a new sound system for the sanctuary, will be functional by the end of December. The momentum for the next step of our building plans continues! Due to the great response of pledges already made for ATOP, the church council has authorized detailed design work for Phase Two. The Capital Campaign Committee has been meeting with OPUS for this Phase. This Phase will include a chapel and gym and multi-purpose studios below. We continue to make progress on the pledges needed to continue Phase Two in 2016. As of December 8, over $545,000 has been committed in new and additional pledges toward our $1,000,000 goal! The Church Council will make a decision on timing based on reaching financial benchmarks by the end of December. If you would like to participate – by increasing or starting a pledge – please contact Pastor Paul or Steve Olson (steveo@normluth.org) for more information and conversation, or click below to pledge online. We are grateful for the generosity of all who have made this possible through their gifts and pledges to the ATOP campaign! We are grateful for the generosity of all who have made this possible through your gifts and pledges to the All Together in One Place (ATOP) Campaign. In fact, we are excited to report that because of your gifts, you have helped make the possibility of Phase Two a reality! The Church Council has already authorized detailed design development to begin. The actual timeline for construction will depend on additional gifts — if enough is secured by the end of 2015, construction could be completed in 2016. We are also excited to report hat the NLC Foundation has led the way with an additional gift of $125,000. This gift, along with gifts of $300,000 from additional donors, has moved us forward to a current challenge match of $425,000 as of this posting. Each new gift or pledge or an increased pledge over the renaming four years of the Campaign will be matched up to $425,000. The goal is to reach a total of an additional $1 million in a combination of these new pledges and cost savings from the completion of Phase One under budget by December 15, 2015. What Does ATOP Phase Two Look Like? How Can I Participate in Phase Two? 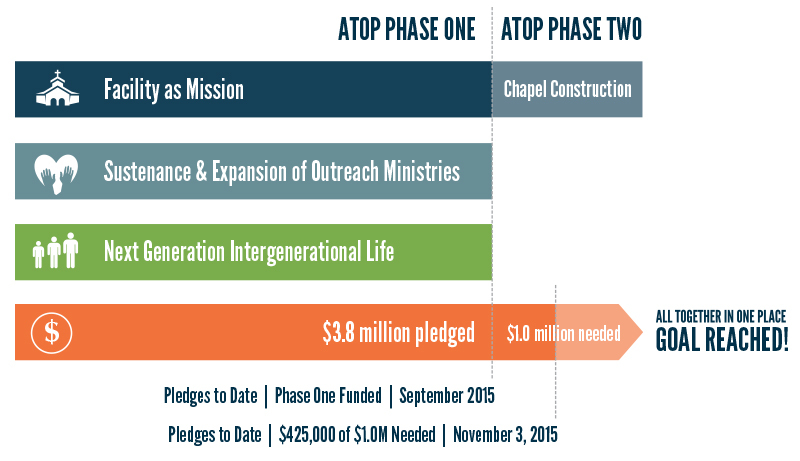 If you have not yet made a gift or pledge to ATOP, a response card will arrive in your stewardship mailing. You may complete this response card and return it to NLC or you may pledge online to join in our shared venture. Your participation matters. All gifts matter. Please click below to pledge to ATOP Phase Two online today! Thank you for your generosity — All Together in One Place! As we enjoyed newly renovated spaces this past Sunday, we also look to the future and all that God has in store. Please join us in Fellowship Hall on either Sunday, September 20 at 9:45 am or Wednesday, September 23 at 7:00 pm as we thank God for all that has been accomplished in his name and for all that is to come. 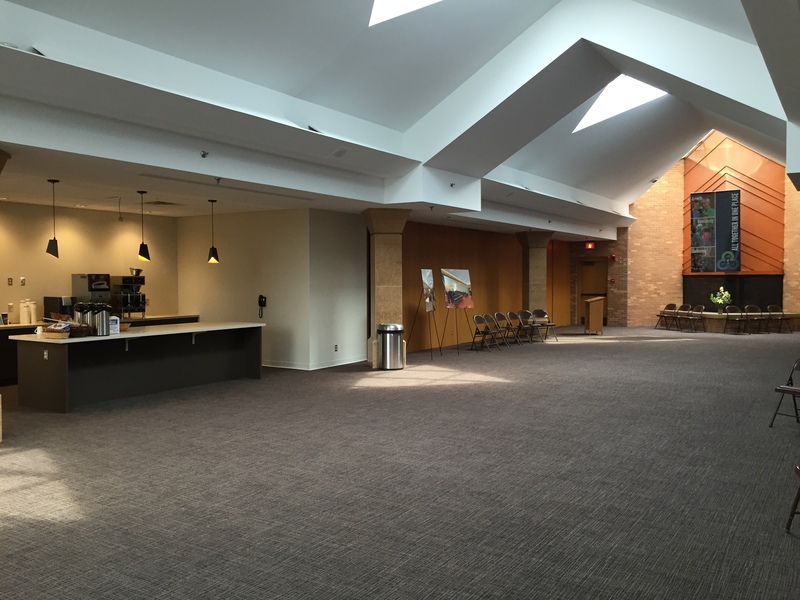 Learn how your generosity has improved our facility for ministry and mission. Learn how your generosity has reached others near and far. 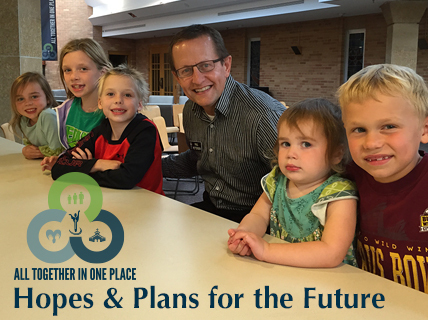 And come hear hopes and plans for the future of All Together in One Place and the mission and ministry of Normandale Lutheran Church. Please join us! 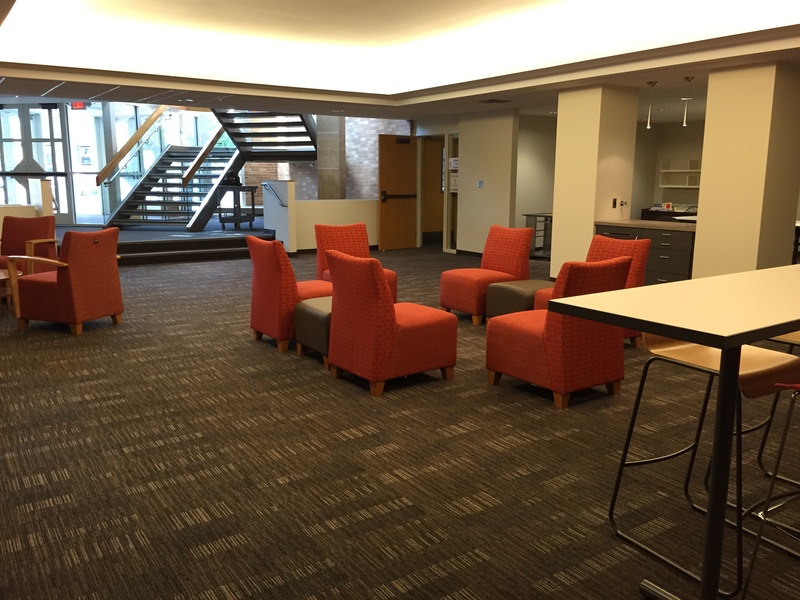 Newly open and inviting Fireside Room and Rear Narthex on the second floor. 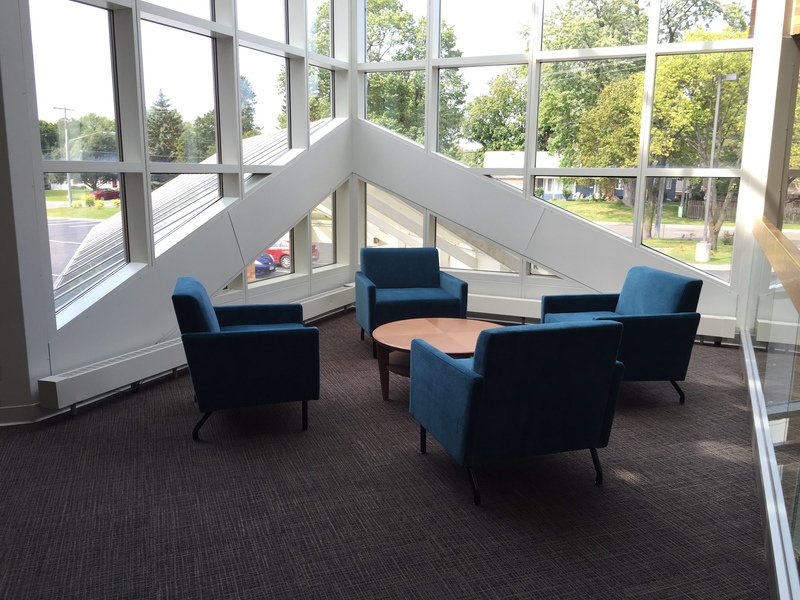 Renovated Landing Area on the first floor and comfortable seating near second floor windows. Work continues on the next phase of construction (scheduled to be completed by the end of November). This includes the new Family Life Center (previous library) and the Center for Healing and Wholeness (temporary offices are in the Gym), and the installation of AV and sound systems. The elevator is out of service during this time. When completed, it will be larger and more efficient. In the meantime, we are striving to accommodate those with accessibility needs. Thank you to our parking team volunteers! 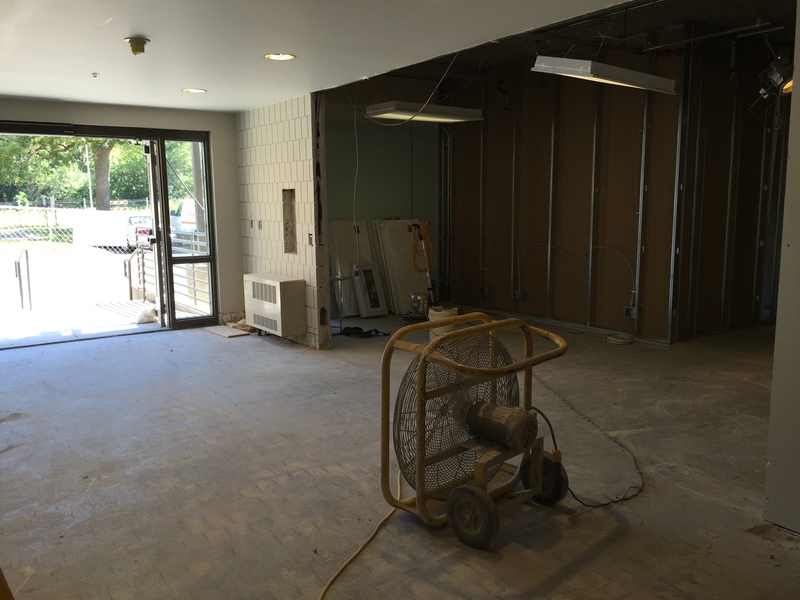 Work continues to improve the elevator and to create a new Family Life Center. 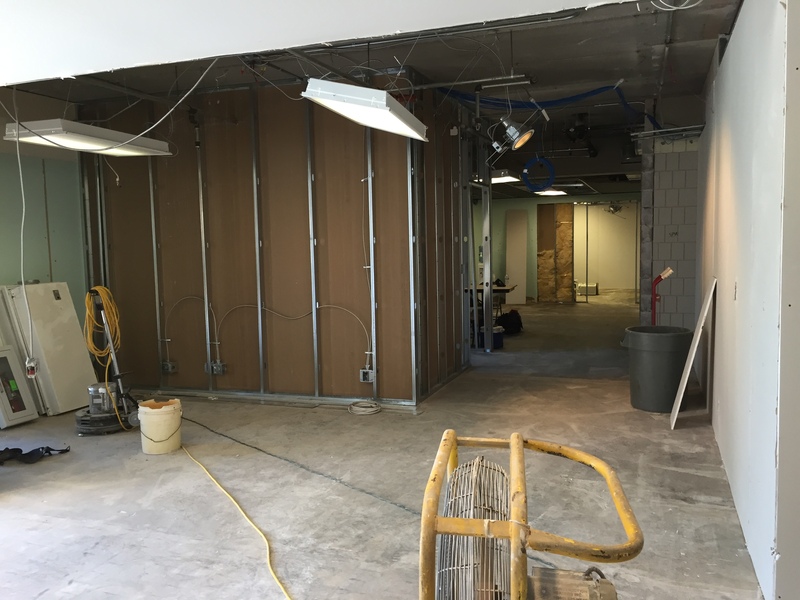 Renovations begin in the Healing & Wholeness offices on the second floor. Please pardon our dust! From now through November, please access the 2nd floor classrooms by using the stairwell at the south end of the building. The stairwell may be accessed at the end of the 1st and 3rd floor hallways or through the outdoor playground entrance at the south end of the building. Thank you for your patience during construction! 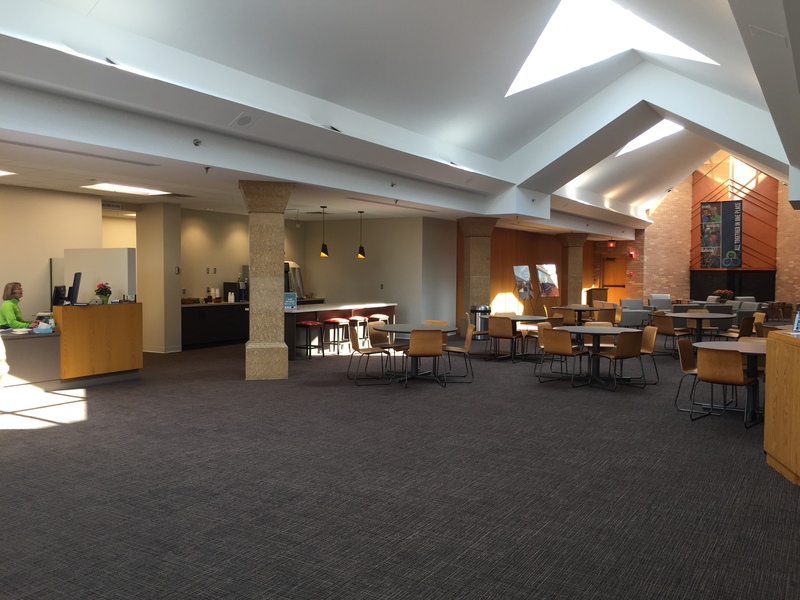 On Sunday, August 10, we will begin to enjoy newly renovated spaces such as the Fireside Room, Landing area, Fellowship Hall, Administrative Offices, and new restrooms. 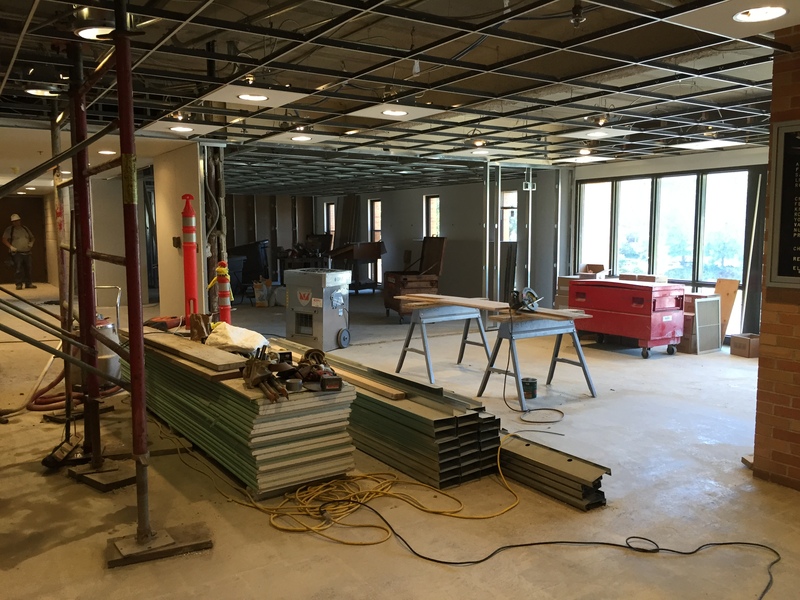 While the majority of the work will be complete, some of the work in these areas, such as technology, AV screens, enhancing sound in the Sanctuary, and new furnishings will continue into the fall. 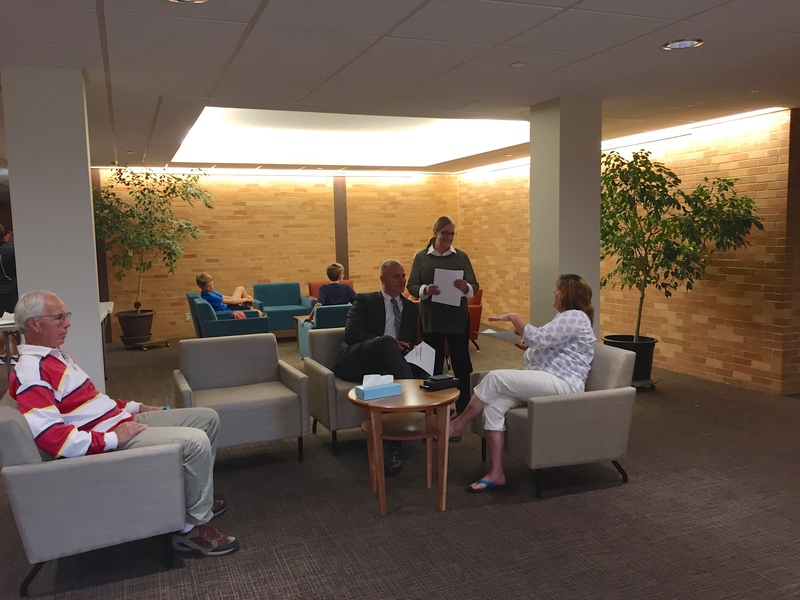 In early August, as we begin to enjoy the newly renovated spaces at the north end of the building, we will begin renewal and construction on the elevator and areas to the south of the Sanctuary, including the former library area and the Center for Healing and Wholeness. Many of these efforts are to enhance ministry and permanently improve accessibility. The work at the south end of the building will impact the entrance on the east side of the building near the elevator on the sanctuary level. This entrance will be closed mid-August through November as we improve the elevator and the elevator will be out of service during this time. Those who need handicap accessibility and same level access to the Sanctuary and second level of the building will be directed to use the door entrance on the upper east side adjacent to the fireplace. On Sunday mornings, Parking Assistants will be available to help those entering the upper east Fireside Entrance. 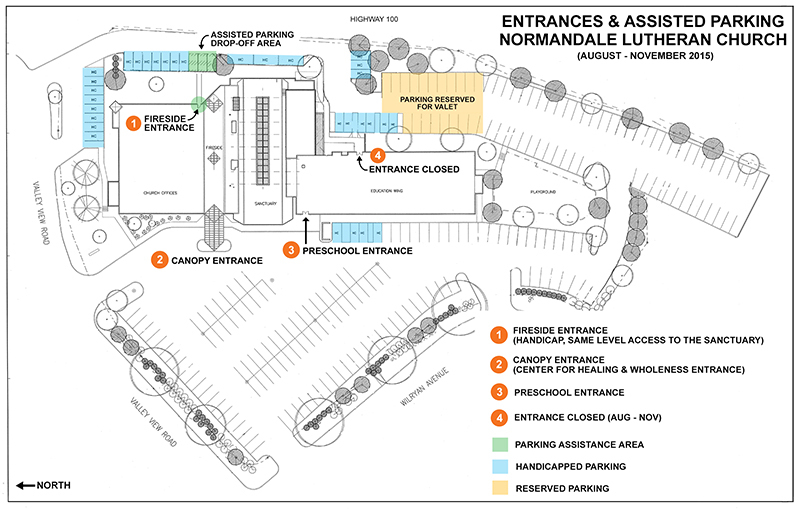 All those not needing same level access will be encouraged to use the lower west parking lot and south lot. In addition, the Center for Healing & Wholeness will move their offices to the south end of the gym on the lower level. Please enter at the west canopy entrance for access to the Center for Healing & Wholeness. The map below shows available entrances and parking. (Click on the map for an enlarged view.) Thank you for your patience and assistance during this time of renewal. We need your help! To aid with assisted parking, we are looking for a team of four Parking Assistants each Sunday mid-August through November for 30 minutes before and after worship to lend a helping hand guiding others into the building and offering assistance as needed. Sign-up to serve as a Parking Assistant once or sign-up to serve a several times. Parking Assistants may easily attend worship when serving. Click here to sign-up online or sign-up at the Welcome Center on Sundays for a shift or two. Please contact Amy James at amy@normluth.org with any questions. A part of a home remodel project often includes new furnishings. The same is true for our church home! Many of NLC’s current furnishings are well worn, meaning they have served thousands of people for many years. As good stewards, we will provide for these chairs and tables to be repurposed and used in other places either within the church building or to be given to others that can continue to use them. New furnishings will complement our renovated spaces and will be another means of providing hospitality to all who enter. Some of the furnishings have been provided for in the construction budget. Others have not, and special gifts for this purpose will help make these acquisitions possible. Interest has been expressed by some in making a special gift for furnishings. In some cases, the gift will be over and above a pledge. In other instances, this will be a specific one-time gift for those who are not able to pledge at this time due to particular circumstances. If you are interested in making a special gift for furnishings, please contact Steve Olson, Campaign Administrator, at steveo@normluth.org or 952.929.1697. You may also click here to give a special furnishings gift online. In late summer and early fall, we will begin a process to determine if and when Phase Two will begin. This will be for the construction of a new chapel and multipurpose space that is projected to be used virtually every day of the year. The commencement of Phase Two will depend on additional and increased pledges. The purpose of all of this project is to improve the building as a tool for mission and ministry. Thank you – we have continued to fund our outreach ministries – and we have not yet had to borrow for construction due to your strong support!